Now we have all seen Pizza Buns in the supermarket before or you may have smelled them baking while you were shopping. That’s just another way the store plays to your senses so you buy a package of whatever is baking. Suggestive marketing by sight and smell has been around for year and years. Today I’m going to show you how to make pizza buns which you can enjoy on their own or stuff them to make a sandwich. I like to stuff mine with fresh sliced ham and mozzarella cheese which just makes the flavours pop in this recipe. Typically whenever dough is involved some people will shy away from a recipe because of time or lack of experience with dough BUT don’t be shy of it. We’ve all had to learn from our mistakes which helped us create experiences. All in all this pizza bun dough recipe will take about an hour to make and get ready for the oven. That’s pretty fast for making your own pizza buns at home. You can’t beat that freshness and if the tomatoes you use are garden fresh, even better. The magical part of making pizza dough is that you don’t have to get bored with the same type of dough. You can add just about anything to pizza dough to make it unique. My favourite is flavoured oils. You can get anything from a basil oil to blueberry. Today I will be using the oil from the sun-dried tomatoes as I want the fresh flavour of the tomatoes throughout and it gives the pizza buns a lovely colour as well. So don’t throw away the oil from the tomatoes. Keep it for another day to add to something else. Remember if you don’t need to waste food in the kitchen, then don’t. The savings stay in your pocket and not in the bin. Pizza buns have long been a favourite of anyone who grocery shops when the flavours permeate around the ares. The good thing about baking homemade pizza is eating it fresh. Place yeast into a jug then add 8 tablespoons of lukewarm water and the sugar and mix. Set aside until mixture is frothy. Chop sun-dried tomatoes into small chunks. In a bowl place the flour, salt, herbs, 1 cup of cheese and sun-dried tomatoes and mix well. Once the yeast is frothy add to the dry mixture, also add in the oil from the sun-dried tomatoes. Gradually add the rest of the water to the mix stirring until it forms a dough. You may have to add a bit more flour to the mixture if you find it too sticky. Then knead it for 5 minutes until smooth. Note: If you have a mixer add all the ingredients into the bowl and mix with flat paddle until the dough is sticky. Then switch out to the dough hook, again if it's too sticky add more flour gradually until it forms a dough. Place in a warm place and let rise for 5 minutes until it doubles in size. Punch dough down and knead for another five minutes. Flour your surface and roll out the dough until it's about 1cm thick. It doesn't need to be perfect but try to get a rectangle shape as this is easier to roll. Once rolled out sprinkle 2¼ cups cheese onto the dough and roll so that you have a nice long piece of dough. You can also add bacon at this stage if you wish.Cut pieces roughly to about 2cm wide. Place on a floured tray evenly apart, sprinkle a little cheese on top of each pizza bun and cook for 20 minutes at 210F/410oC. The pizza buns can be frozen once cooled. You can also freeze from dough stage. If you bake from frozen just add 5-10 minutes extra to cooking time. There you have it, an easy pizza bun recipe for any occasion that can be eaten hot or cold. Besides enjoying stuffed pizza buns with deli meat why not use the dough to cover hotdogs? 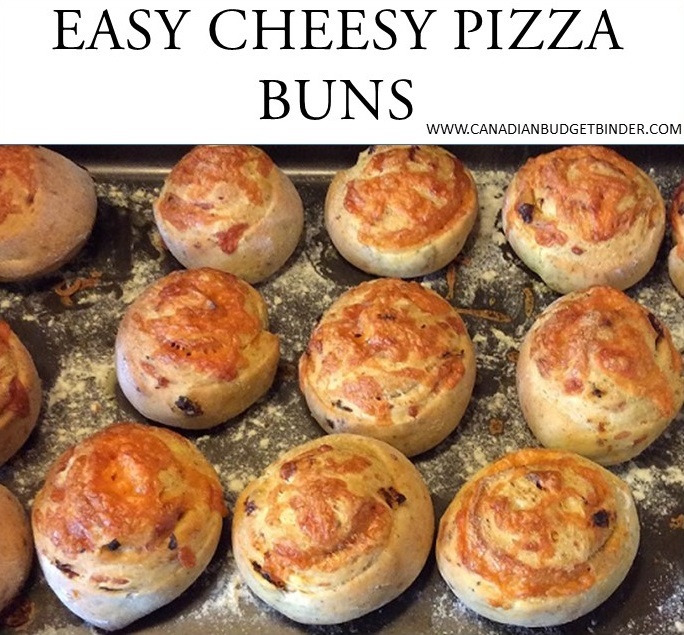 Whichever way you enjoy these pizza buns they definitely are a great addition to meals. Hi Nicola, thanks for the recipe, looks very delicious. Pizza buns? Why not! I would love to try this one! Nicola, with just a picture, l can imagine the aroma of this delicious pizza buns! So yummy! Perfect for afternoon snacks. They look amazing! I have not had pizza buns since having to go Gluten Free. I am going to convert your recipe to Gluten Free and try them. I will let you know and will take pictures only if they turn, and if my family can in fact eat them. These look so much better then the ones in the stores Nicola!! They would be a big hit in kids lunches too I’m sure!! Thanks!!! I know, that’s what I was saying to my wife yesterday too!